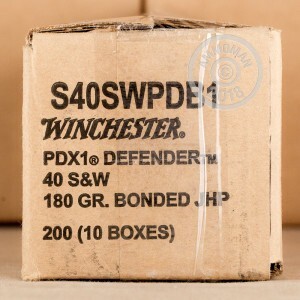 Be ready for the unexpected with this 40 S&W Winchester Supreme Elite home defense ammo! Your trusted leader in ammunition has formulated this line with your personal safety in mind. This product was awarded the 2010 Golden Bullseye Award for "Ammunition Product of the Year" by Shooting Illustrated magazine, one of the NRA's premier publications. The Bonded PDX1 line uses the same technology the FBI uses as its primary service round. The bonded round works together for consistent expansion and will penetrate barriers such as clothing, drywall, plywood, and auto glass. The 180 grain jacketed hollow point bullet is sure to create a devastating wound, stopping your attacker in their tracks. These 20 rounds will be delivered to you in brand new condition. 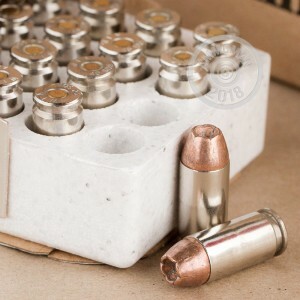 The nickel-plated brass casing will help to prevent corrosion of your ammunition, as well as promote a smooth feed into your handgun. 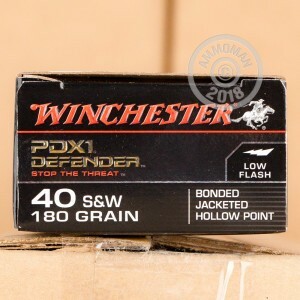 The cartridges are also Boxer primed and can be reloaded. Winchester, founded in 1866, is recognized all over the world as being a leader in the ammunition industry. Their products accompanied American settlers as they moved west to seek their fortunes, hence the nickname "The American Legend". You can't go wrong with Winchester.